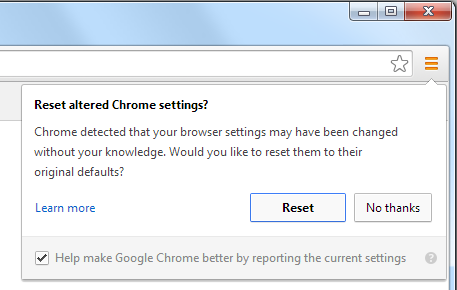 Chrome added Browser Reset feature to their chrome browser. Now user can easily reset the chrome browser settings back to default settings. Here what you need to know about this feature. Some extension change default browser settings to something else without the concern of user, and thus it affects user experience on the browser. To crackdown this issue chrome announced that it soon stops supporting extensions outside the chrome store. But what if your browser setting changed automatically without your concern while installing any software like free screensaver, games etc.? this issue cannot be controlled on Google Chrome store, and many users are complaining about some program hijack their browser settings. So to fix this issue they added reset button. If you are Chrome user, then your browser might automatically updated to the latest version. If you’re using the latest version then you can see this feature by going to chrome://settings/ (enter this in your address bar) scroll down the page, you will see Show advanced settings… link, click on that link and again scroll down to the bottom of that page their you will see “Reset browser settings” options. Once you click that Reset button, almost all your browser settings will back to browser default settings. Here is the list of changes that happens to your chrome browser when you click that button. Default search engine and saved search engines will reset to defaults. Homepage button will be hidden, and the URL that you previously set will be removed. Default startup tabs will be cleared. New Tab page will be empty. These are the things which affects currently, and this list may change at anytime. For more information about those changes you can visit this page. When my browser automatically get updated, I immediately greeted with Reset altered Chrome settings? alert box. I think it’s because I myself changed some chrome settings like Reverted Google Chrome New Tab to Old Tab (Remove Search box) and few other changes I made. So my guess is, this Reset alert ask even if you change some settings by yourself. Don’t worry, it asks only one time that too when it was first installed. I think this is not a best way to fix this issue, because if you click Reset button then it will reset lot other settings which you have personally changed. Instead, it should ask what problem user is facing by giving options and based on user response it should change those settings to default settings. I’m sure this Reset feature will not work on all the changes that had happened to your browser. If user just tried Reset option and this option still didn’t solve that problem then what? He lost his previous settings without actually solving his problem, and thereby he created more problem. Maybe they should consider adding Backup option before any user try to use Reset option. So that user can get their settings back. There are still few missing things we can find on this feature. But we have to understand that, they just released this feature now only. After some days we may get a better version of this feature. This browser Reset feature will be useful if you have not changed any settings on your browser. If you have changed any settings, then you will miss all those or most of those settings if you use this feature. So I recommend you use this option only if it is really needed.